Watch Empire on Fox, Wednesday nights at 8pm. Photo courtesy of Fox Broadcast Co. The Lyon family is a hot mess this far in the season with only four episodes left. We have Jamal — the most together member of the family — whose maybe-baby drama lead to his hot Latin-lover Michael walking out on him (apparently Jamal’s from some utopia where black men in music can just be gay and out), Andre forgetting to take his meds as his clench-jawed White Wife leads him to overreach, Hakeem putting all his mommy issues on Naomi “blood diamonds” Campbell, and Cookie left just tryna make that dollar because her head never left the game. If you’re not Team Cookie, something is wrong with you. Lucious has a very bad day with his ALS, collapsing publicly and having to pick a wife to join him at the hospital. Anika’s feeling pretty tall as she climbs in with him, but girlfriend, you shouldn’t have to work so hard to get his attention, okay? Also, the man is going to the hospital, stop being so basic. Hakeem treats Mommy Issues to a fabulous five-star dinner, presenting her with some personalized necklace he had made at Six Flags — the same place he gets his videos made. The boys are fighting with each other, new baby girl Rudy Huxtable 2.0 is being left on elevators, but there is money to be made so this family needs to pull it together. Cookie Lyon is the one to make them stop their messing around and deliver for the investors. The family does what they’re supposed to do, and Courtney Love — playing Courtney Love from a few years ago — shows up clean and ready to pretend she’s a soul singer. Lucious loses his voice and needs someone to go out and give the investors the ol’ razzle dazzle. Naturally they put the woman who just finished a bid out there, and she slays it. She’s an ex-wife, so they know she’s not gonna sugar coat things, and that’s just the level of realness those rich white people want. She’s so good that Lucious — sitting right next to Boo Boo Kitty — says “I love you, Cookie,” and doesn’t bat an eye. GIRLFRIEND!! GORL! How can you clench that jaw even tighter? Is the money that good? Okay, it is, I get it. But I don’t like you for it. Anika heads off to Chicago, Lucious schedules a family meeting to tell them he’s dying; then several things happen. One, Andre loses his damn mind, yelling at White Wife and freaking out in the shower, ruining that custom-made suit. Two, Hakeem reminds us he’s still a baby. He just wants Daddy to be okay. And three, Jamal drops all the beef, wanting to support his pops because Jamal is better than all of us. 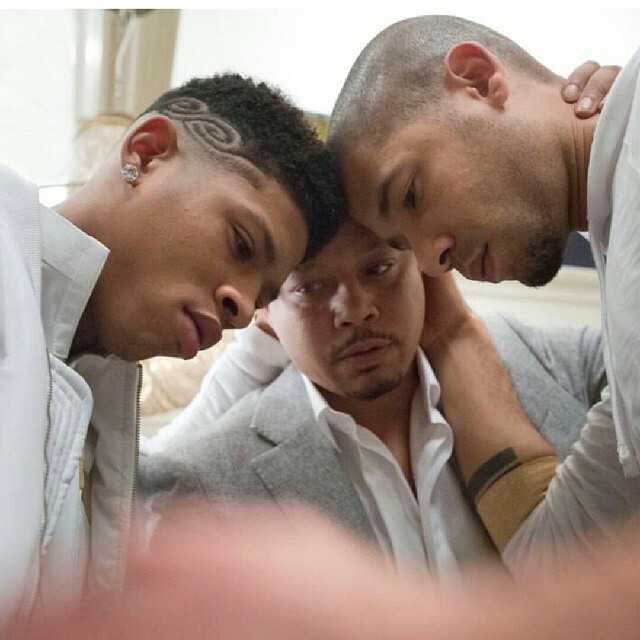 And Cookie… Well, her tears remind Lucious of what they had. He picks her up, throws her on the bed and they do the do to some Anthony Hamilton. And let’s just take a moment to remember that Cookie hasn’t had the D in over seventeen years. I hope he did special anniversary things to you, Cookie, I really do. OH BUT HOLD UP. Anika just “decides” to end her business trip to sneak back home and literally catches Lucious with his hand in the Cookie jar, and you could hear my evil cackle in outer space, I hope you know. Anika’s tears be going drip, drop, drip-drippity drop. I’m so glad they didn’t drop any slurs this episode, but am I wrong to think what I do about the light-skin vs. darker skin issue on this show? Hmm, Gabourey Sidibe is dark (and her clothes have been fabulous, thank you costume department for proving you can dress a large woman with class), and Becky is in a position of power, so maybe not always. And while I love the chemistry between Terrence Howard and Taraji P. Henson, we all know he’s no good. Right? And I’m telling you, Jamal/Jussie Smollett is the real deal. Laura Stone is a novelist, media junkie and the head writer at Hey, Don’t Judge Me, but can usually be found trolling the wine aisle and trying not to pop and lock to grocery store music.